July 1st 2014 until June 30th 2015. Congratulations to the North Sydney Team and especially Peter Ryan and Evan Smiles... plus our own Alex Whitlock. 2nd place which means we are improving!! Congratulations to the North Sydney Team and especially Mitch for his 4th place. Mitch with 2 of the best! A good turnout of club members (12) and visitors, considering the bad weather both forecast and experienced. Barry, Mitch and Peter towed boats to the lake and others came prepared to do most of their fishing from the bank. It was a sight to see the lake at 100% and the jetty in use with water right up to the camping areas. Fishing in general was slow but Mitch landed a bag full and Mark (Livo) was proudly announcing that he had landed his first ever Trout (rainbow), followed by a few more. Frank Carabetta gave a very detailed and informative talk on the Wed night prior to the weekend ensuring anyone going on the weekend was well prepared, thanks Frank a great job. Frank also went up a little early to try and determine where the fish were and did quite nicely on the fish, unfortunately he couldn't stay for the entire weekend. In total 7 anglers made the trip and for the club this new location proved to be a winner, everyone caught fish and the area is so nice it is planned to schedule another trip on the club's calendar. Alan Harvey was the comp winner for the weekend, well done Alan. All in all a great place for a weekend away, Steve and Donny were the caterers and chefs for the weekend as well as the fire officers, in between fishing of course and being entertained by the chatting of Barry and Andrew in their nearby boat. The weekend comp was finished up with the weigh-in and bbq at John Rule's house, once again many thanks to John and Christine for their hospitality, the afternoon and evening was thoroughly enjoyed by all. Salmon caught on the weekend was filleted and cooked on the bbq along with John Rule's tasty fish kebabs and enjoyed by all with Christine's homemade hot chips passed around by club junior James Schumacher. 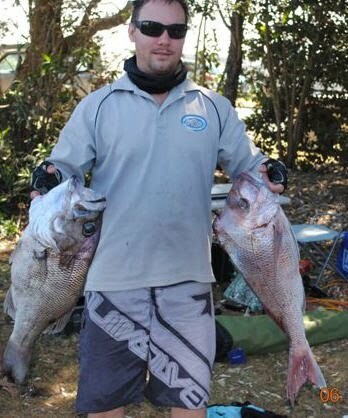 There were a number of anglers who weighed in and a few categories were fished, the fish of the comp was by Frank Carabetta with his jewfish, 10.94kg cleaned, well done Frank !! Phill Theuerzeit also had a great Trumpeter whiting (winter whiting), great stuff ! New member Will Radley had a nice flounder and snapper, Barry Edmondson fished estuary weighing a salmon, John Rule had a bag limit of snapper and Phil Tregaskis followed up his snapper catching prowess again weighing in with snapper among his catch. Next comp is just a short one this Saturday with the bbq at Apple Tree Bay hope to see a few there. With strong wind warnings forecast for the weekend the club still had a few anglers heading out in the cold of the early morning. The day turned out to be nice and sunny and 19 people for the afternoon social side of the comp were at the weigh-in, gathered on the grass with the KHACC banner proudly displayed, enjoying sausages from the bbq, thanks to our new President Mitchell for organising the day and Henry for all the food. There were only 4 anglers who weighed in, John Rule had his bag limit of Snapper, so winner for the day, Harry and Julius also weighed fish along with Steve Nowlan, among his catch a terrific Kingfish. 11 people weighed in for the first open comp for the competition year, and a great start with two new junior members weighing in, Sophia age 9 and Ruby age 8 both put fish on the scales, well done girls. Phil Tregaskis had a very nice snapper, Julius Varga held the heaviest flounder title for all of a few minutes before it was outdone, Henry Ludowici weighed a bag limit of carp including a huge one over 8 kilos, Scot Schumacher started off Rock fishing and ended up Beaching it, hope you are feeling better Scot ! A big thank you to Frank Carabetta for his hospitality hosting the weigh-in and ensuring everyone was comfortable and well fed. The weather smiled on everyone and a fantastic day was had by all that fished this beautiful location. 8 people weighed in but it was terrific to see others came and enjoyed a sausage on the bbq at the weigh-in, a total of 14 members thorougly enjoyed themselves, socialising and chatting about details of how their day had gone. Everyone pitched in and as you can see by the photos it really was a very enjoyable and successful day. Congratulations to Mitchell Burge having the best catch for the weekend, he fished hard all weekend and did well then backed it up by providing the bbq for all the club members at the weigh-in. A great turnout with lots of fish weighed in but Mitch was the clear winner with 11 species ! Well done to newcomer Will who also had a good catch and to all the other members who braved the cold ( bung boat motors ! ) and fished. This was the last club open comp for the competition year and the challenge was on for a few for championship wins. From all reports a great weekend was had by all with an excellent social evening around the camp fire. Well done to Henry having the best catch for the comp ! The summary of results can be viewed on the attachment below. at the bottom of this page. These are a couple of the fish caught on the lure day by Phill Theuerzeit. A new style of comp for the club which went down very well with all involved, all anglers felt good about releasing the fish and a positive way to help protect the environment and sustain our waterways and fish stocks for the future. Our Publicity Officer Mitchell Burge had a great catch and was the clear winner for the day among his catch were flathead, bream and whiting, well done Mitch !! Andrew Letho, the outing captain had a nice flathead and was kept fit running to the water releasing the fish. Welcome to new club member Mark Barnes fishing his first club comp. John Rule does it again !!! 7 species and only fishing on the Sunday after having boat trouble and convincing an ex-member with a boat to take him out, look in the next magazine Winter edition for the full story. A good turn up and Henry with some great carp. CONGRATULATIONS to John Rule winner of the comp ! There was only one KHACC team entered so a fantastic result, well done to Number 1 John Rule, Stoffy, Mark Pursehouse, Brian Gleeson and Dereck Kong. After a week of rain on Saturday the conditions soon after leaving Hornsby were rather damp with heavy rain all the way to Gosford. The Central Coast seemed blessed as we had a dry evening, with clearing skies and stars in the sky. The prawning started soon after dark with 6 participants and continued through to about 1.30am through the tide change. The prawns were a bit hard to come by but the group managed over 150 good size prawns for the evening. Cooked on the spot at 2am and consumed with a few beers we declared that these were the best tasting prawns on earth !! A really enjoyable night and outing. On the way home though the skies opened up like it was driving through a waterfall !! Thanks again to Andrew Dombrovskis for the photos and all the details. Young Harry Burkitt caught the most (3 carp), Phil Tregaskis caught the biggest at about 4kg. Rudi and John got one each and Andrew got a couple. Henry - the Carp Champion - Ludowici was Captain for the day but unfortunately did not land one, he is pictured here with a 15 kg carp caught on another day. Too hot for the fishermen and too hot for the fish, but great company and a great weekend. The scales, the scales, where for art thou scales ? Henry is quickly dispatched to pick up an alternate set so the proceedings can begin. Sausages sizzling, anglers eagerly awaiting the chance to put their catches on the scales and scoff into the bangers. 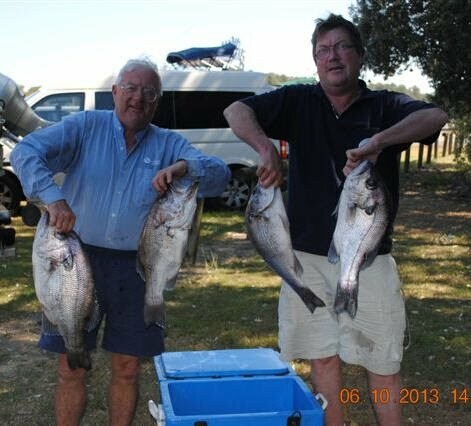 A great weekend was had by the talented veteran angler Henry Ludowici, he weighed an impressive 10 bream for 9.4kg.